The World Cup qualifiers begun in the group of Death where Nigeria were pitched to feature against Cameroon, Algeria and Zambia. The Eagles knowing how tough the group would be started on a good note beating the Zambia side 2-1 in Ndola to secure the three points away from home. The Eagles were at the upper hand with quality combination among the trio of Mikel, Iheanacho and Iwobi in transition as Eagles penetrated the Zambia defence with incisive passes and silky movement in their opposing half. All said and done Nigeria leads the group. As we expect the Algerian side in Nigeria later this year, we take a look at the significance of Nigeria’s victory over Zambia in terms of Nigeria’s chances of qualification. Here are five things we learnt from the Super Eagles defeat of Zambia in Ndola. 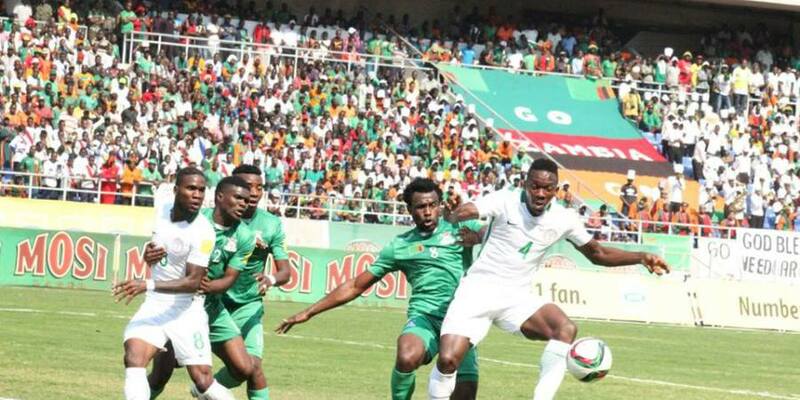 The 2-1 away win over Zambia was a sure sign of where the dominance lies between the two teams. The Southern Africa have tried to overthrow the West Africans but have failed in most attempt no matter how close they come. The Super Eagles of Nigeria just like they did against South Africa maintained their dominance over host Zambia in the field of play as Iwobi and Iheanacho gave Nigeria a reason to cheer again. The 2-1 away win has once again restored hope to Nigerian football after a year full of adversity for Nigeria in all ramification starting with Nations Cup (CHAN) group stage exit under Oliseh (as well as his mind boggling resignation) and the AFCON ouster against Egypt to the recent exit of the Flamingoes from the Jordan 2016 U-17 Women World Cup still on going but the likes of Troost-Ekong, Iwobi and the Iheanacho (some of Nigeria’s top performances against Zambia) have given Nigerians some hope to cheer as the duo (Iheanacho and Iwobi) exhibited football dynamisms in the field of play to catapult the Super Eagles to a 2-1 away win on the Zambian territory. The fleet and silky combination of the aforementioned duo alongside the benevolent assistant of Mikel and Onazi in the midfield saw the Eagles held way for the entire context as Nigeria reignite their hope for qualification for Russia 2018 away from home. The Nigerian team under Gernot Rohr is certainly a team under construction and one of the areas of proper examination is the full back position. With the invitation of Musa Mohammed many wonder how come an inactive player makes the Super Eagles Squad for National assignment but the truth here is that Nigeria is richly blessed in the right back position. There are some decent personnel waiting in the stands to fill those position in future assignment in relation to Mikel Obi’s suggestion about Ola Aina (Chelsea right back at 20) representing Nigeria ahead of England. No wonder out of place Wilfred Ndidi a defensive midfield player for RCC Genk was deployed out of position to the detriment of the team as Rainford Kabala made fun of him. Also left back Elderson Echiejile needs to be observed closely bearing in mind that the Eagles have a more reliable and robust left back in Kingsley Madu and Olympic talent Stanley Amuzie who are very much vibrant on the left back position. Super Eagles was likened to the 94 side especially during the break under the euphoria and influence of Iheanacho magical goal in the 42nd minute of the game but the clear difference between the U.S.A 94 squad that boost of (Jay-Jay, Oliha, Oliseh, Keshi and Siasia) is the depth of talent in the team. The Super Eagles then was top quality as the second eleven is as good as the first with Okocha interchanging with Siasia. That was how good the team were in 94 as they were widely known for their dominance and swashbuckling style of play which placed them above their opposition in most of their games. The Eagles just lost Isaac Success and Victor Moses (just 2 player in attack) and the team struggled to work through the wing with efficiency. lf not for the gift of individual brilliance of Kelechi (Iheanacho) Nigeria might have dream the match as the Eagles mostly relied on the dynamic movement of Iwobi and Iheanacho from the middle. There is need to call up more quality players in order to strength the reliable bunch as we work our way through the qualifying series for Russia 2018 World Cup. The Super Eagles of Nigeria needs cohesion as much as they needed the quality and class of players like Victor Moses and Etebo Oghenekaro in the team for future assignment. With Omeruo coming in for Balogun (due to injury) there was a lack of understanding under pressure at some points in the game as responsibilities were clearly note stated. The midfield showed quality but can be better in transition with a level of cohesion and co-ordination in the midfield region. More player with high level of affinity among themselves (Iheanacho and Success) can be featured to promote understanding and cohesion along with consistency within the team. Cohesion as well can also be achieved through engaging the Super Eagles in friendly matches (quality fixtures not just any team) ‘Africa’ who will not test the Eagles in terms of tactical and positional discipline. The NFF (Nigeria Football Federation) must come to this aid and get Eagles (Rohr) friendly game in attempt to improve his team.